Site Enhancing Oils, or ‘synthol‘ as commonly known, are possibly the most controversial subject in bodybuilding. That is because there is a huge amount of miseducation and ignorance on the subject. I first published the article below on the internet in early 2000, and since then it has been reproduced on countless websites and I have become known as the world’s most authorative person on the subject, even consulting in the latest book on the subject written by the ‘inventor’ of the original seo, Chris Clark. Syntherol is my favourite simply because is the only one that I know of that is made by a real pharmaceutical company, so guaranteed sterile, plus it hurts less and the results seem to be better – don’t take my word for it, ask around! It’s the same formula as synthol/PumpnPose, with added silica, which is a safe way to make the gains more ‘permanent’. It’s very refined, so it flows freely through a 28gauge needle, unlike the others which need as much as 21gauge needles to go through properly! EsikClean – same formula as synthol, but it has colagen added. That makes it a very bad choice to use in my opinion. When you use site oils, the biggest problem is the formation of scar tissue. You don’t want any scar tissue build up when you use site oils. Scar tissue is colagen buildup due to the trauma caused to the muscle by sticking a needle in there. As such, I would not help the build up of scar tissue in the muscle by injecting colagen. So, that’s a bad choice. $100 per bottle www.synthol-direct.com Plus these are the people that counterfited Chris Clark’s PnP and Synthetek‘s Syntherol, so one wonders how ‘genuine’ they are. Their associated websites are www.synthol.com, www.finalabs.com, www.zoelabs.com, www.pumpnpose.com, www.primolabs.com I strongly recommend that people stay away from them! To increase size, lets use the biceps for example. You need to inject in EVERY head of the muscle, while rotating the shots daily within that head. This is the only way to ensure that the added size keeps to your natural look/shape of the muscle. The quickest way to get a muscle up to maximum size is to do the following regimen: 1ml for 10 days in each head of the muscle. 2ml for 10 days. 3ml for 10 days. If you do both, the biceps and triceps simultaneously, you can add up to 3″ on your arms in those 30 days. Now, this is VERY IMPORTANT!!! : you HAVE to massage the area that you just injected SEVERELLY! You have to make sure that there’s no lump forming. The muscle should always be soft. You should NEVER have a lump. It is also a good idea, to inject just before going to the gym, so as soon as you get to the gym, you should do a couple light weight, high reps sets for that muscle, to get the blood moving. This again will minimise lump formation. You have to keep in mind, that as soon as lumps form because you did not massage, scar tissue will form as well. You want to avoid scar tissue at all costs. Also, to minimise scar tissue build up, use VERY small needles, like 25g or 26g, inch or 1inch long (depending on the injection site) and inject VERY slowly. If you find that you cannot keep with the lump build up, but you are due for another shot, wait until, by massaging, the lump goes away (it should not be more than a couple of days) and then resume from where you left off. PECS – pecs are a very large, ‘flat’ type of muscle. As such, the injections have to cover the entire area of the muscle, to ‘lift’ it at the same time, otherwise a lumpy look will result. I recomend three rows of three shots per pec per day. How do Site Oils work? To begin with, they do not stay in the muscle for 3 to 5 years. They get dissipated within months. However, during this time, they have stretched the fascia of that muscle. The fascia is a great constrictive factor in muscle growth. 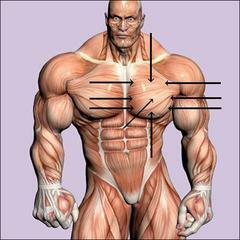 The more stretched the fascia is the more the muscle will grow and the more it will have that `popping’ look. Site oils stay in there long enough for the fascia to stretch. As they dissipate, the `space’ left by them is replaced with new muscle tissue growth. That is the reason why when x-rays/MRIs where performed on some of the people that have 25″+ arms, there was no oil found in there. The oil dissipated and it was replaced by real muscle. Pain – obviously, any site shot hurts. The pain will minimise the more you inject, until it will not hurt any more. Site Oils hurt, but not as much as site injections with, lets say, Sustanon or Testosterone Propionate. However, as I said, they will hurt less and less the more you use them. Dangers – Site Oils are safe, if certain precautions are taken, same as when injecting anything else. You always have to aspirate. Always! You DO NOT want the oil to go in a vein. Always massage the area after the shot so scar tissue build up doesn’t occur. And most importantly – USE COMMON SENSE! If you have 16″ arms, don’t think that you will have 23″ in 5 weeks! Because if you try that, you will end up with deformed looking muscles and you will be the laughing stock of the world. On a side note, people like Greg Valentino have implants, not seo‘s in their muscles. It is physiologically impossible to look like these guys do with SEOs. Hopefully that puts that myth to rest. Site Oils are there to help you break past a plateau. If your genetics indicate that you are 242 with 5% bf, but you only have 18″ arms, then Site Oils will help you bring your arms in proportion.